Double click images to see a lot more, if you please. Eight companionable pards from MN, IL and WI gathered for BAR Game #60. We commenced at 10:30am concluding at 4:30pm with a decisive result. The scenario was played lengthwise on the Main and two Side tables. 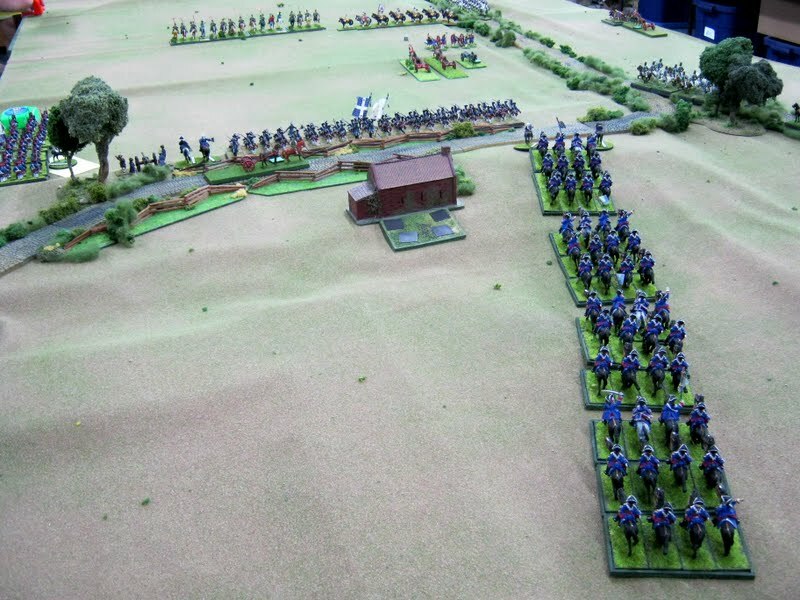 The French were deployed in screened columns of march heading eastward on each table. 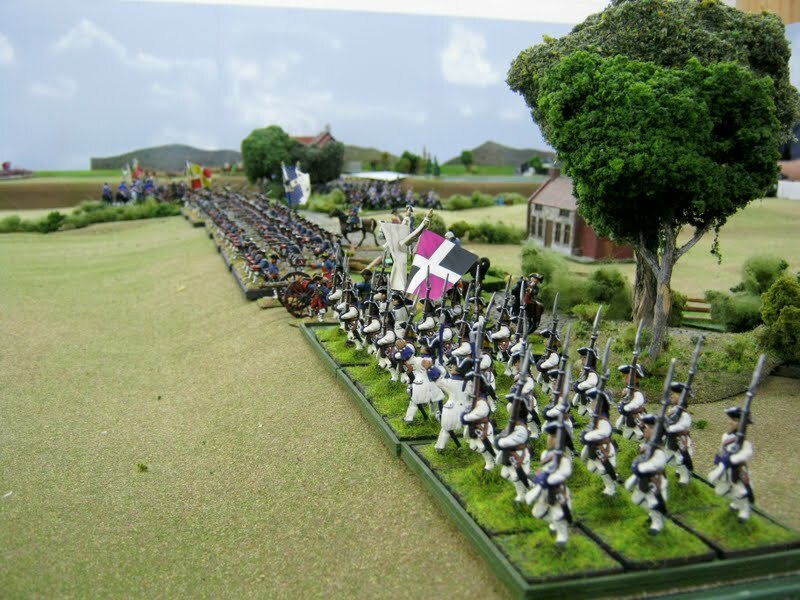 After viewing the French columns, the British positioned themselves father to the eastward crossing the T of the French. An unknown brigade of French horse deployed afterwards. 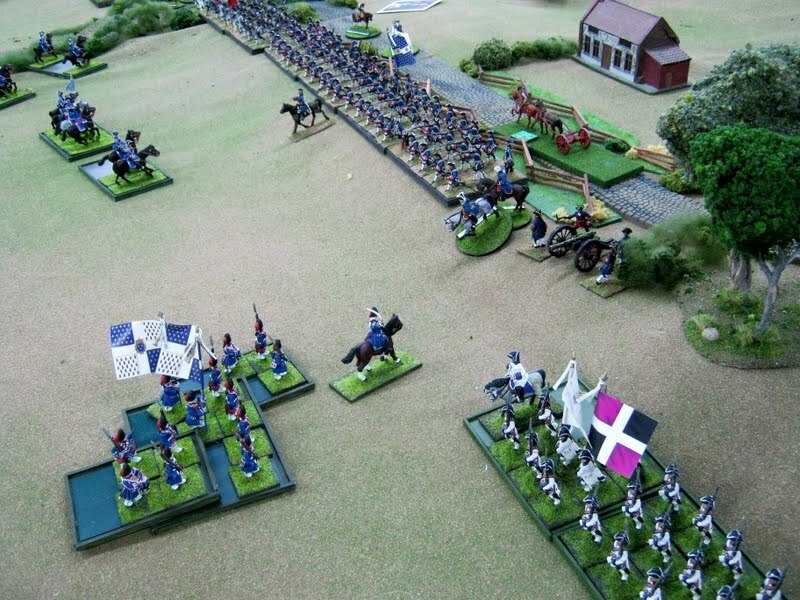 A few turns into play, four squadrons of Gallian/French Royal des Carabiniers await orders to deploy. They will eventually pass to the right of the Gardes Fraincaise in the center of the photo. Far in the distance de Saxe Lanciers and Saxon Leibkürassiers are deploying to slow the foe. The latter are off the top of the photograph. Soon the British marched up a rise appearing in ribbons of colour. 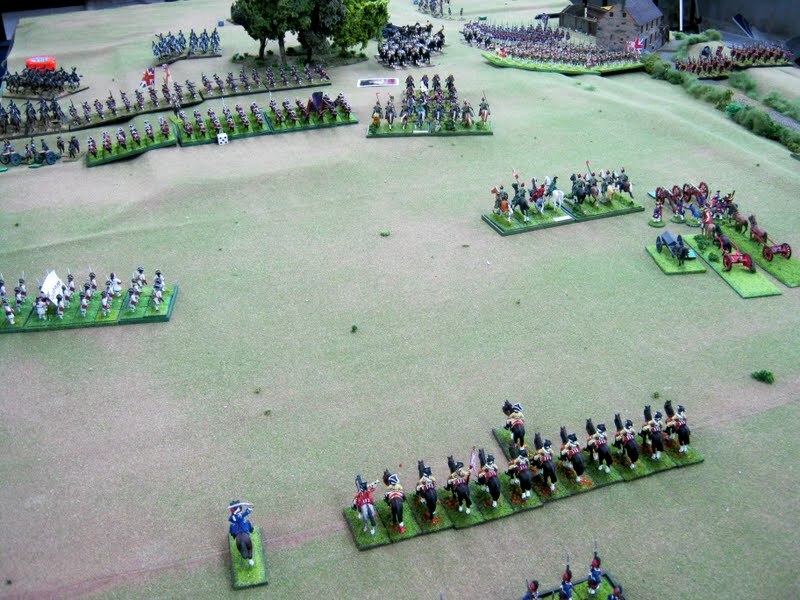 One troop of de Saxe Lanciers engaged enemy cavalry to slow them down. 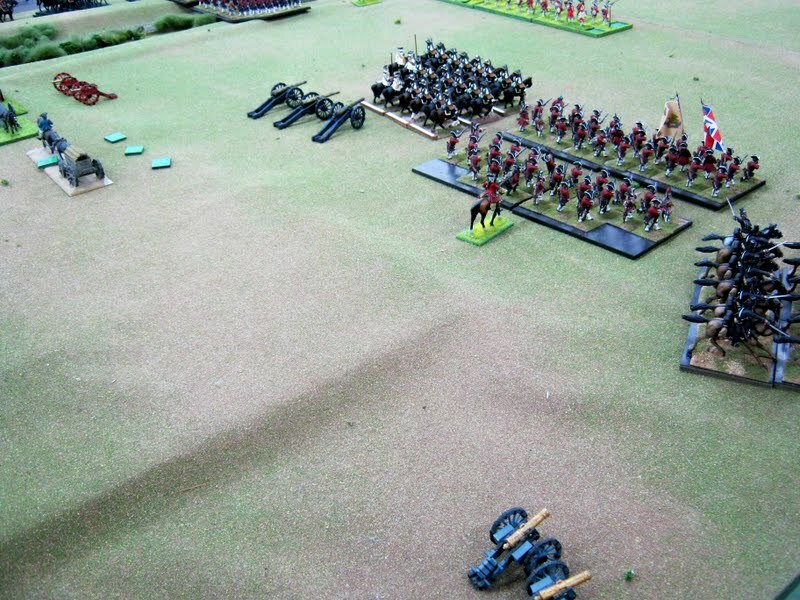 Eventually the second troop and the Leibkürassiers would be drawn in too in an entertaining see-saw battle lasting several turns. These cavalry forces exhausted themselves and were unable to take further action in the battle. The Britannian 60th Foot advances resolutely toward the forming Gallian battle line. 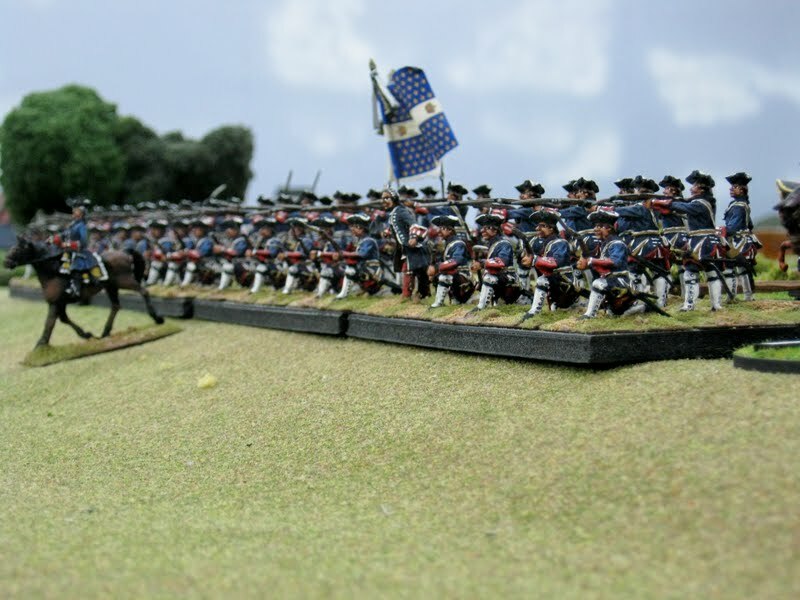 2/Grenadiers de France await the approach of the foe and the outcome of the cavalry battle. 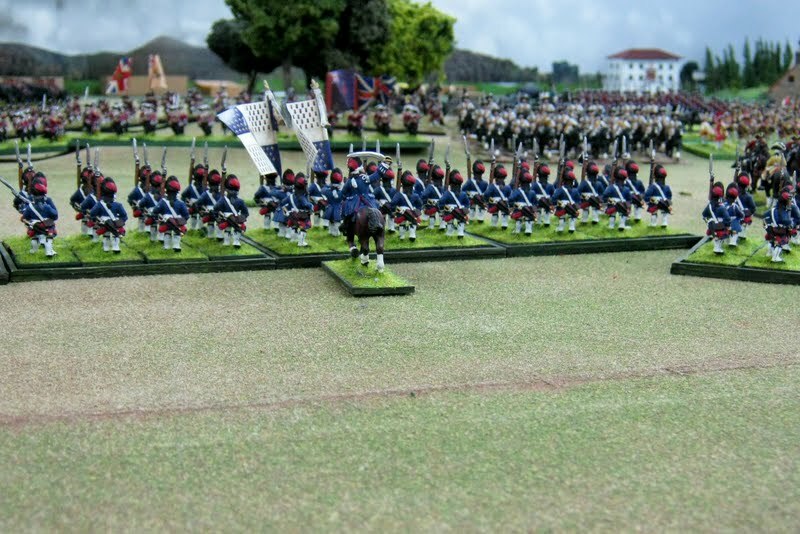 The grenadiers are Front Rank Miniatures from the UK. Two thirds of the way into the battle, the Britannians successfully forced back all Gallian forces on The Main Table. Almost all of the artillery of both sides was lost here. Not pictured: Three 12 Pounders (large blue guns) were taken out by a squadron of Royal des Carabiniers who sneaked into position for a successful charge behind a French battalion. Another squadron took the 60th Foot in the flank routing it. 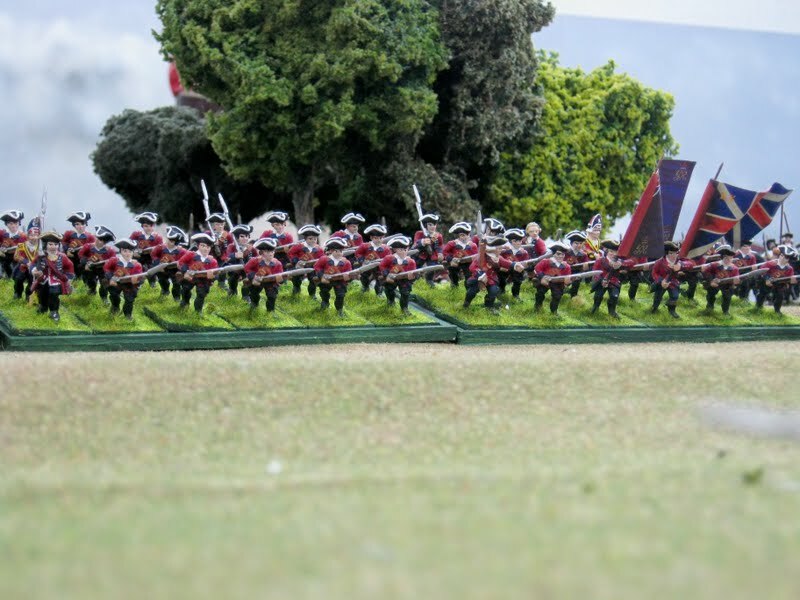 A third squadron was severely mauled by musket fire. The fourth was unengaged. The Gardes Francaise remained atop a ridge acting as a last reserve or rallying point in the rear. Gallian forces retreat to the Gardes to form a second battle line. 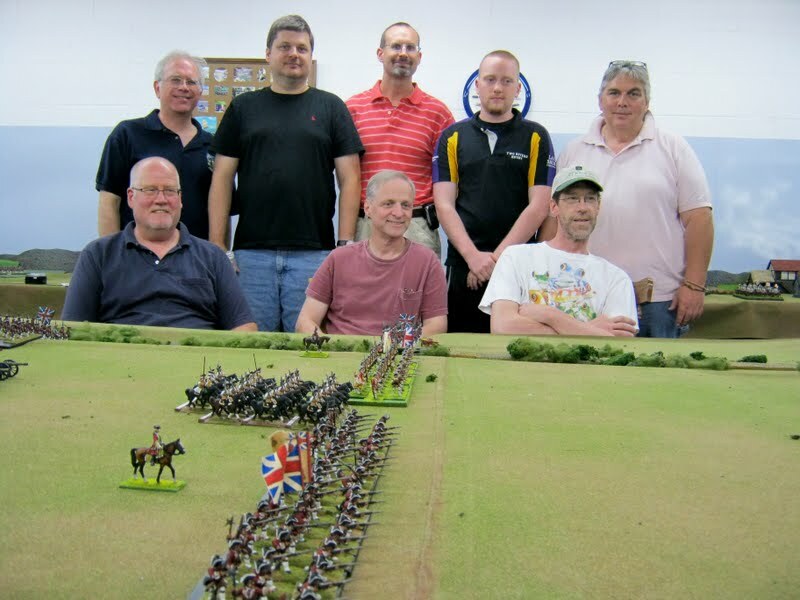 Observing the victorious Britannian battle line advance at game end seated from left to right: Brent, Jim/Der Alte Fritz and Jon. Standing left to right: Bill (yours truly), Curt, Derrick, Andrew and Todd. We sensed the Britannians had the upper hand. Add the fact that Gallians had lost a lot of combatants. The Britannians had lost their heavy battery needed to assault the ridge line, but had really only lost one battalion; the 60th. I have little idea of the condition of forces friendly or foe on the Side Tables other than to say the Gallian North Table would probably succumb whilst the South Table was in good shape. The latter would provide the proverbial cavalry force to cover our withdrawal. We had a lot of fun, laughs, good chow/snacks and a scenario said to have been very different and entertaining. Thanks a million to our companionable pards. Without you, this game experience would have been vastly different. You made it a terrific game and people experience.